For those of you who have been lamenting that there is no “good music” out there, let not your hearts be troubled. Dirty Streets are here to wipe away your tears. 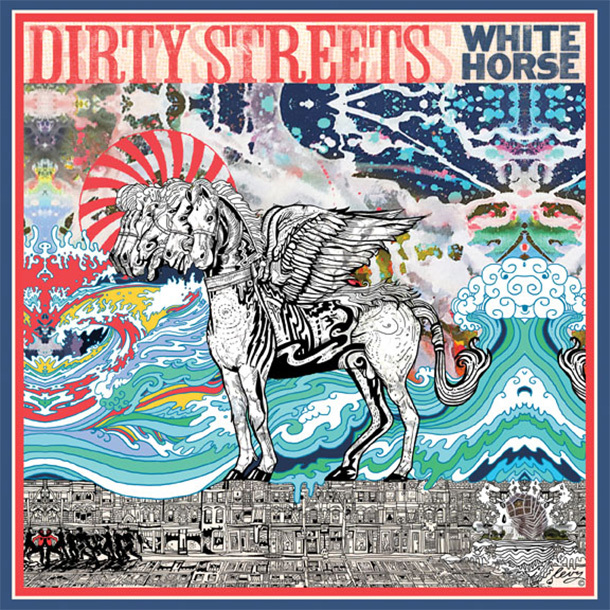 Their brand new record due out November, 2015 called White Horse is a collection of 11 rock and roll tracks that will make you swear that you’ve been transported back to 1970. Get out your lava lamp, throw on your cleanest dirty tie dye and fire up some incense so the folks won’t get a wiff. White Horse from the Memphis power trio of Thomas Storz, Justin Toland, and Andrew Denham, feels like a natural progression from their last record, Blades of Grass, which had the boys experimenting a bit with keyboards and such. Here they just simply bust out the jams. They describe their sound as proto-punk but do not let that fool you. White Horse is some of the best rock and roll you will hear this year. The production is lean and mean. All the sounds are very warm and natural. The vocals and guitar work are soulful and the bass and drums lay down one tastey groove after another. White Horse opens with the sing along “Save Me” and the boys keep things rocking hard until we get to the acoustic country-soul of “The Voices.” The only other a brief respite from the ear bleeding is the psychodelic and very melodic “Dust” where the Streets reference the “Hey Joe” bass line. The rest of the record is one catchy, grooving, guitar driven track after another. While some may try to marginalize Dirty Streets as some sort of revival act, there is no denying the passion and excellent songwriting craft here. If you like your rock and roll down and dirty saddle up and take a ride on the White Horse.